Greetings from the Pee Farm! Well, the weather forecasters are predicting a good ole nor’ easter for tomorrow into Friday. Accumulation forecasts are all over the map. As usual, we will see what actually ends up on the ground when all is said and done. In the mean time, before hunkering down for the storm, I thought I would squeeze in a blog post. I know that I have posted about the coyote problem that is facing the nation many times, but it is a nuisance that is not going away, and we still haven’t sufficiently gotten the word out about the usefulness of 100% Wolf Pee in combating this situation. Below are articles from states across the nation that have been written in the past few weeks alone. 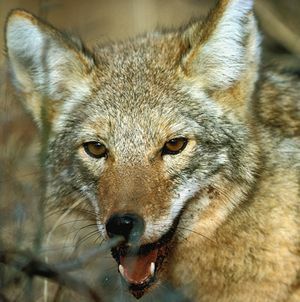 They vary in tone, but they all recognize the growing threat of the coyote to small pets at the very least. One article mentions that the coyote has become the top predator since the eradication of wolf and mountain lion in some areas. Well, it stands to reason that if the wolf is a step above the coyote in the food chain, the coyote has instinctual fear of its natural predator and that is why even if the coyote has never seen a wolf, wolf urine will scare them. But, I will let you make up your own mind about that . . . I received this testimonial in my Peemail box just today . . .
Posted on February 12, 2014 by The PeeMan. This entry was posted in In the News, Informational Articles and tagged coyote deterrent, coyote problems, coyote repellent, how to deter coyotes, how to keep coyotes out of an unfenced yard, how to keep coyotes out of your yard, how to repel coyotes, keep coyotes away with wolf urine, keep pets safe from coyotes, wolf pee, wolf urine as coyote deterrent, wolf urine as coyote repellent, wolf urine coyote deterrent, wolf urine coyote repellent, wolf urine for coyote. Bookmark the permalink.